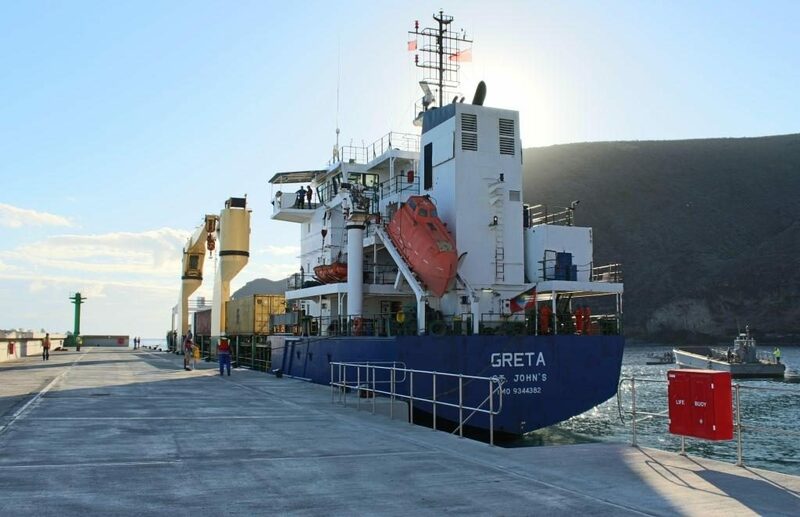 The MV Greta, chartered by Basil Read, arrived at St Helena late on Friday 1 July 2016, to transport materials and equipment to and from the Island for the St Helena Airport Project. Also on board the vessel were several containers of foodstuffs for St Helena which were offloaded directly onto barges and transported to Jamestown Wharf. The MV Greta was due to berth at Rupert’s Wharf, St Helena’s new facility, on Saturday morning – but as this was the very first time a vessel would dock alongside the new wharf and wet and windy conditions were encountered on Saturday a more cautious approach was adopted – and the berthing was postponed until Sunday when better weather conditions were forecast. The MV Greta made her approach to Rupert’s Wharf early on Sunday morning, and berthed successfully at around 8am (pictured). This was the very first time a vessel has docked at the Permanent Wharf in Rupert’s and marks an important milestone for the Airport Project and for St Helena. Thanks are extended to the Basil Read team, the team from Solomon & Company, and to the team on board the MV Greta.